Have your keyboard and mouse low enough so you can relax your shoulders and have your phone close so you don't have to reach for it. Do not use your head and shoulder to hold the phone. Use your hands or get a head piece. Walk around every 20 minutes. 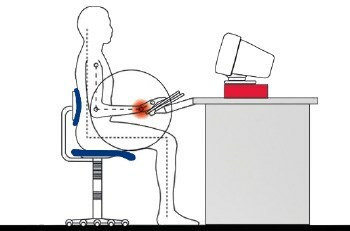 Stretch your legs and arms while at your computer. Set your chair to a height so your feet rest flat on the ground. Make sure the distance between your eyes and your computer screen is around 50-70 cm. Keep your head directly over your shoulders and your shoulders over your pelvis. Avoid crossing your legs when sitting to ensure proper blood circulation. Wear shoes with good support and cushioning if you have to stand all day. A rubber mat will also ease the pressure. Make sure your screen isn't too bright. You want something that is soft on the eyes, but still clear. You should have normal room lighting and not work under fluorescent lights. 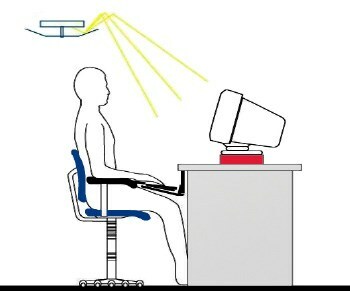 Eliminate glare and screen reflections by moving or tilting your computer or getting an anti-glare screen.